This is, unabashedly, a repeat of last year’s post (and the year before, et al ) … the same information holds true for 2014! And congrats to Sky, the Wire Fox Terrier, for her Best in Show (BIS) win at Westminster Kennel Club last night! Once again, we’re gearing up for the largest dog show in Colorado … The Rocky Mountain Cluster to be held February 13-17 in the Hall of Education at the National Western Complex, 4655 Humboldt in Denver. The Premium List, which contains information on the show, parking, maps and entry, can be found here … Premium List. The Judging Program is up so you can determine what breed is in what ring at what time. If you’re thinking of attending, please be sure to give yourself plenty of time for parking, getting into the facility, and then finding the right ring and some chairs (rings are marked by numbers on tall poles). Parking, depending on where one finds an open lot, can run anywhere from $5 to $10 — and it may also be a very long walk! Entry fee to the Expo Hall is $5. Please note that dogs not entered in the show are not allowed on the site. If considering crowds/parking, Friday or Monday would probably be the better of the four days to attend. As the largest show in the region, the selection of vendors and their wares is pretty amazing … if it’s dog related, you’ll find it at this show! From art prints, to clothing, to grooming supplies, to dog beds, to canine-related jewelry, to crates and tables, it will be available. Might want to bring the plastic along (and keep in mind that the vendors start packing up on Monday for the return home). Our recent foster, Mia, went to her new home last weekend. And got a new name in the process … Abbey Roze. She’s already settled in like she’s lived there her whole life. I’m certain she’s enjoying the one-on-one attention with her new family. 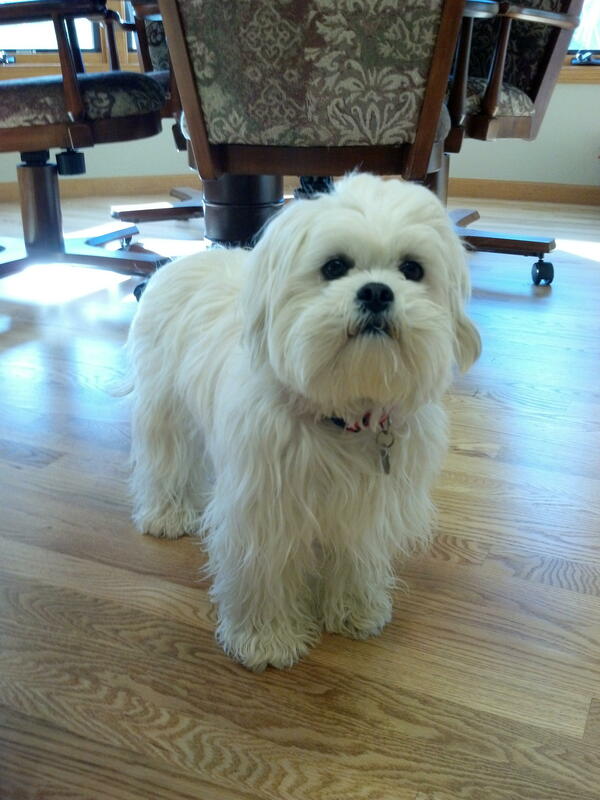 A very lucky dog, Abbey will get to go to work with her new mom (if it sounds like I’m jealous, I am!!!). Mia/Abbey’s journey to rescue was a bit unusual. She was found wandering in Aurora, CO. The family who found her managed to locate her owners and she was returned with many comments on “what a nice dog and how well behaved.” Five days later, the original owners brought her back and asked the finding family if they’d like to keep her as the original family had little time for her. While with the new family, there was a change in circumstances with their daughter and grandson moving back home with their own pets. Simply put, it was too much for the family to absorb/manage and they contacted us. Arrangements were made and Mia/Abbey was picked up by our foster family (Neil and John) and transported to Loveland to keep her from being placed with a puppy broker in a kennel facility. Big thanks going to Neil and John for making the trip when I couldn’t! That was September 11th … Colorado’s flood would start that evening with torrential downpours which stranded John and Neil in the Big Thompson Canyon. Talk about getting her in under the wire … or water as the case may be! Mia/Abbey had an uneventful stay in rescue and a quick recovery from the spay. Well behaved, she got along with all the dogs in the house and perfected her house training and crate training while in foster care. 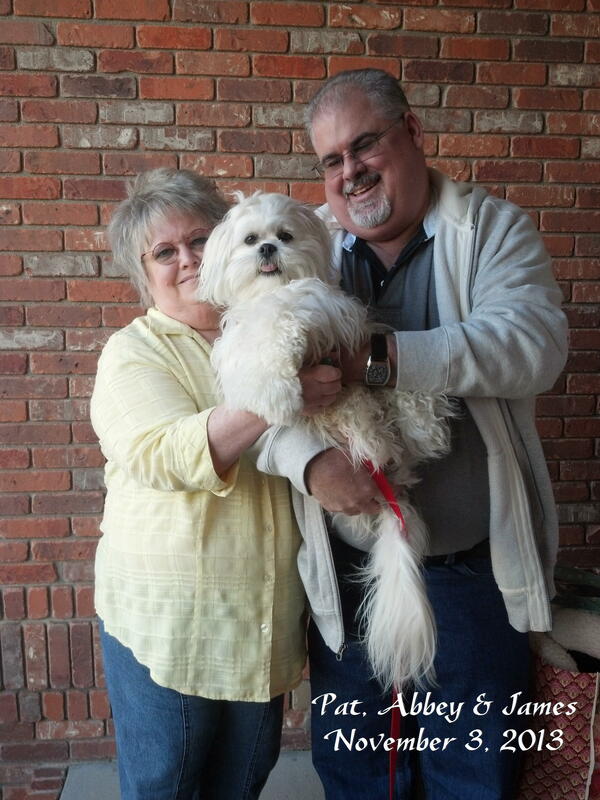 Meet Abbey’s new family … congrats to Pat and James on the new addition to the household. 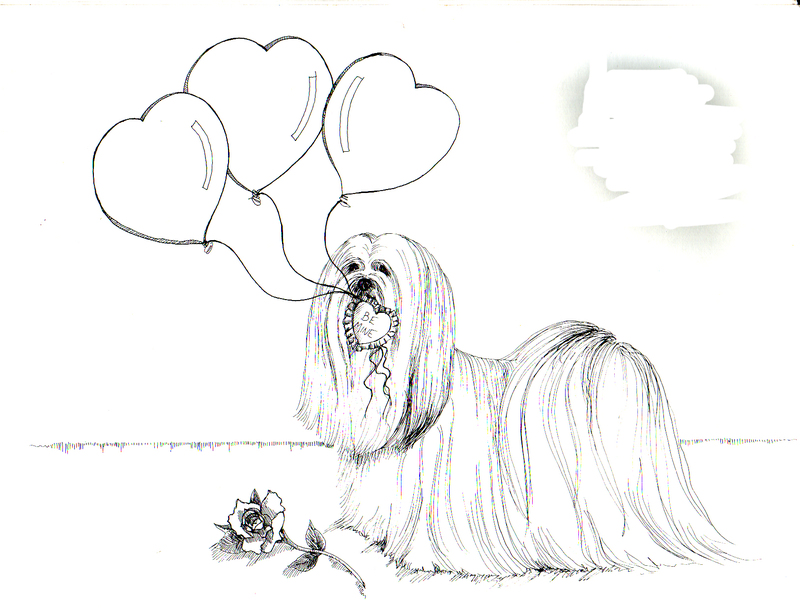 We wish you “Lhasa” happy and healthy years together! 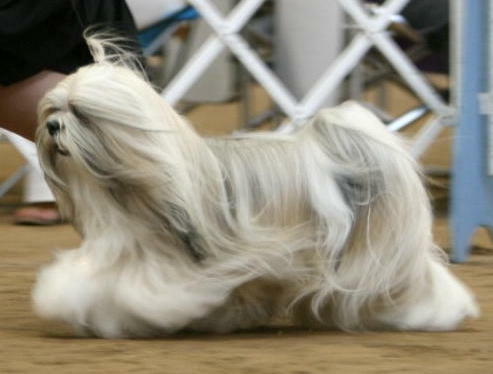 Mid October saw Teller and I at the American Lhasa Apso Club’s National Specialty in Sacramento, CA. A week of shows, activities, seminars, the annual Board Meeting and the annual General Meeting makes for a “working” vacation. While we didn’t get any points in the ring, our showmanship (and Teller’s behavior) improved each day … a “win” in and of itself. Some days/shows, it’s the little things that count the most. This is unabashedly a repeat of last year’s post (and the year before, et al ) … the same information holds true for 2013! Once again, we’re gearing up for the largest dog show in Colorado … The Rocky Mountain Cluster to be held February 15-18 in the Hall of Education at the National Western Complex, 4655 Humboldt in Denver. The Premium List, which contains information on the show, parking, maps and entry, can be found here … Premium List. The actual times for judging and the ring numbers are not disseminated until just a week before the show; we’ll post a link to the judging program when available. If you’re thinking of attending, please be sure to give yourself plenty of time for parking, getting into the facility, and then finding the right ring and some chairs (rings are marked by numbers on tall poles). As promised, here’s a link to the ~~> Judging Program <~~ for the Rocky Mountain Cluster starting Friday, February 17, 2012 at the National Western Complex located at 4655 Humboldt in Denver. Admission is $5 and expect to pay anywhere from $5 to $20 for parking. This is a huge show so give yourself plenty of time to get there, get parked and then inside the building. If you’re hoping to catch the Apsos in the ring: Friday, Ring 7 at 2:00 p.m.; Saturday, Ring 7 at 11:05 a.m.; Sunday, Ring 6 at 1:15 p.m.; and Monday, Ring 6 at 12:30 p.m. Please note that Ring 6 is in the basement. Given the entry this year, Friday and Saturday will be the best days to see more Apsos. This is unabashedly a repeat of last year’s post (and the year before, et al ) … the same information holds true for 2011! 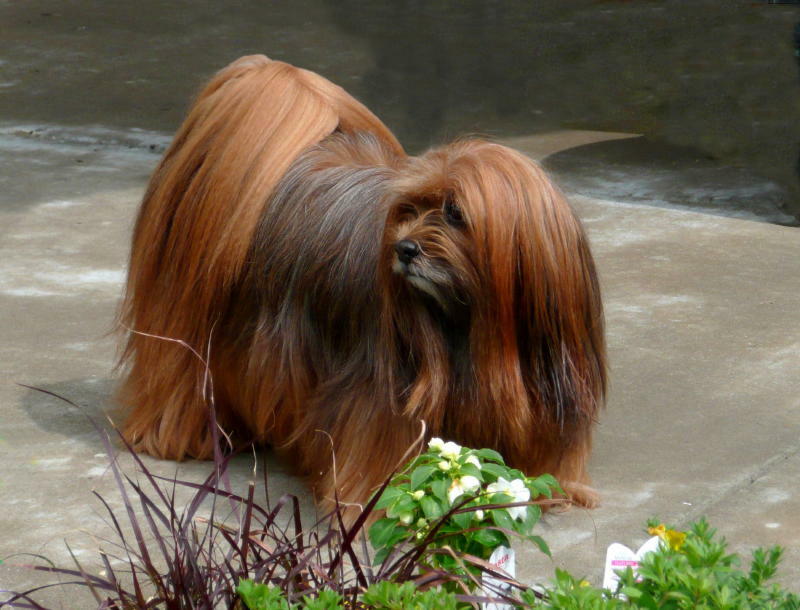 Once again, we’re gearing up for the largest dog show in Colorado … The Rocky Mountain Cluster held February 18-21 at the National Western Complex (Expo Hall), 4655 Humboldt in Denver. The Premium List, which contains information on the show, parking, maps and entry, can be found here … Premium List. The actual times for judging and the ring numbers are not disseminated until just a week before the show; we’ll post a link to the judging program when available. Update: As promised, the Judging Program is available and here’s the line up for the Apsos: Friday, Ring 9 at 12:15; Saturday, Ring 4 at 10:35; Sunday, Ring 6 at 12:25; and Monday, Ring 6 at 9:40. Please note that Ring 6 is in the basement. If you’re thinking of attending, please be sure to give yourself plenty of time for parking, getting into the facility, and then finding the right ring and some chairs (rings are marked by numbers on tall poles). Parking, depending on where one finds an open lot, can run anywhere from $5 to $10 — and it may also be a very long walk! Entry fee to the Expo Hall is $5. Please note that dogs not entered in the show are not allowed on the site. If considering crowds/parking, Friday or Monday would probably be the better of the four days to attend. As the largest show in the region, the selection of vendors and their wares is pretty amazing … if it’s dog related, you’ll find it at this show! From art prints, to clothing, to grooming supplies, to dog beds, to K9-related jewelry, to crates and tables, it will be at this show. Might want to bring the plastic along (and keep in mind that the vendors start packing up on Monday for the return home). Few things are free in this day and age … or economy. And do I ever have a deal for you!! 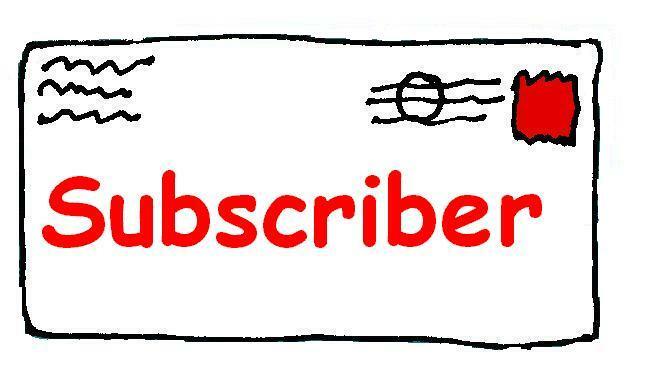 One can get their very own subscription to Apsolutely Newsworthy just by scrolling down on the right side, finding “Subscribe” and clicking on “Fetch! !” Once signed up, you’ll get notification by email when we update the Blog. Which may be hit or miss some weeks/months depending on what’s going on. Is that a deal or what? All brought to you by our friends at WordPress.com who are constantly finding ways to improve our blogging experience. It also means you’ll stay current on our Apso journey … come along for the ride! And speaking rides, tomorrow would be a good day to head to Denver for the dog show. 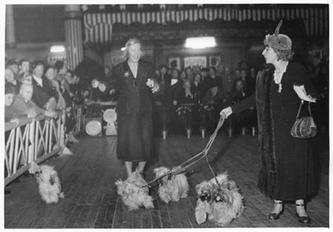 If you’ve never been to a dog show in Colorado, this is definitely the one to see! Spread over four days, four floors and two buildings, you can find everything at this show … agility, rally, obedience and vendors galore.